The single-player mode will feature a tutorial and 15 different levels, of which each one can be played in the normal mode and a challenge mode. The challenge mode will be unlocked after completing the level in the normal mode and alters the level to make it more difficult (for example destroying a castle with the first strike). Completing these challenges unlocks achievements in Steam. 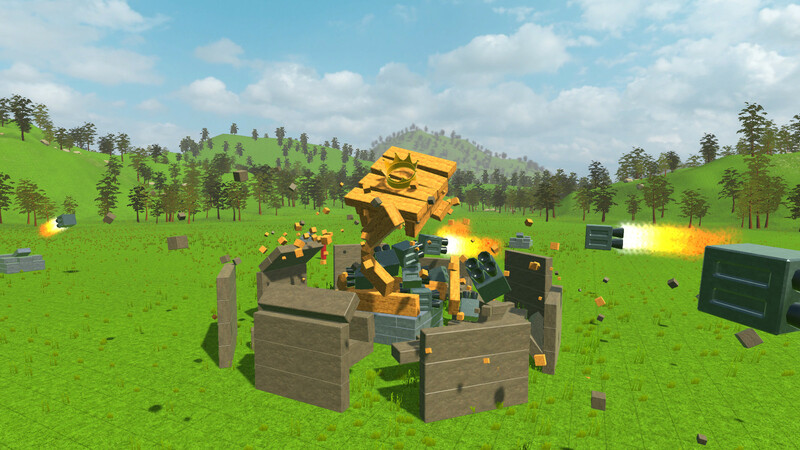 Crown defence: In this mode, the player has a crown on a podium or tower and has to defend it from incoming attacks by constructing defences. Castle siege: This mode is essentially like Crown Defence, but the other way round. Here, the player has to attack a castle and bring the crown to fall. Transport: In this mode, the player has to build structures in order to transport and object from one point to another. Balancing: The goal of this mode is to place a certain number of blocks on top of a small pillar without having them fall down. 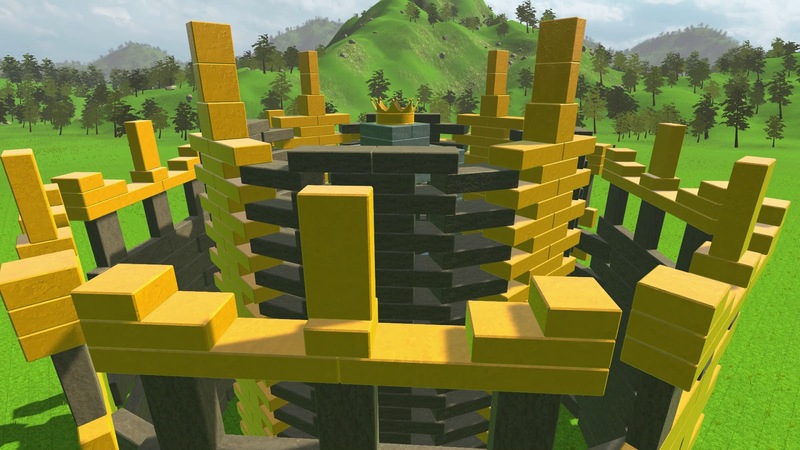 Tower construction: In this mode, the player has to build a tower of a specific height. Other: There are some levels that have other goals or mechanics that don't fit in one of the categories above. Each level takes the core rules of one of the types above and creates a new situation where the player has to solve a puzzle or improve his constructions in order to beat the level. Like already mentioned in the last post, I'm currently working on the Steam integration, which includes Achievements/Stats as well as enabling networking over Steam. With the implementation of Achievements and Stats being complete (only the icons are missing), I'm now working on the networking code. The multiplayer menu, where you can create lobbies and join existing ones before you enter a game is almost done, lobbies even have a chat function now. The thing I'm currently focusing on is porting the Unity networking code to work with Steam. In the next days I will continue to work on implementing the new networking code while trying to get the other parts to 100% completion. Internal tests on Steam will start once that is complete. Due to the delays in the past weeks, the release of the game is now set to Q1 2016, while the start of the beta is still planned later this month. I'm sorry for all the delays and changes of the release windows - it is really hard for me to estimate the development time as Brick Inventions is my first game of this scale and it is also the first game to be released on Steam, which makes things more complicated. Since most parts of the game are almost complete now, there shouldn't be any major delays though, so I'm confident that it will arrive early next year. I hope you like the trailer, the next post will be about the beta. Until then, stay tuned!